Opus the Penguin and his fellow the Old Bloom County denizens are back after a 25-year hiatus. The Pulitzer award winning satirical comic strip literally awoke yesterday when Opus awakens after what he discovers from Milo is a 25-year nap. Creator Berkeley Breathed pulled the curtains across the strip in 1989. Bloom Count was my all time favorite cartoon strip. Berkeley blended politics, cultural commentary, fantasy and humor, lampooning everything from Disney, AT&T, Apple, Mary Kay, Michael Jackson and environmental activists to misguided government policies and televangelists. 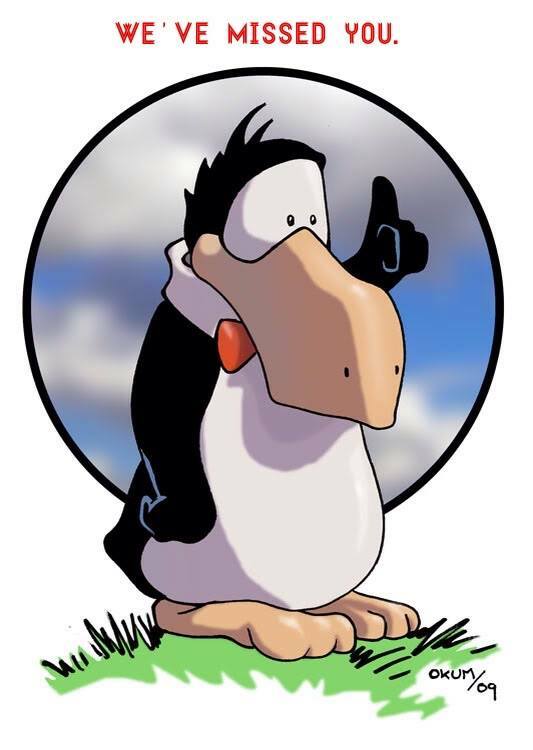 Breathed was awarded the Pulitzer Prize for Editorial Cartooning in 1987 for his work on Bloom County. The strip was published in an astounding 1200 newspapers. I stumbled upon it during a trip to the Terry Fox Centre in Ottawa (Encounters With Youth) in 1982 and followed it through to its demise on August 6th, 1989. I enjoyed the spin-off Outland as well, but never had much of an opportunity to taste that short lived Opus strip. I am pretty sure that it did not run in any of the papers in Newfoundland and Labrador. My late Aunt Shirley in Ingersoll, Ontario, would dutifully clip the latest cartoon out of the London Free Press and send a special package to me via snail mail in St. Bernard's once a month. I grew up in the 80's and Bloom County was a creature of the 80's. These were my teen and early university years. It was a unique amalgam of contemporary politics and fantasy, all told with hilarious humor and wit. A period that was dominated by right wingers like Ronald Reagan,Brian Mulroney, Oliver North and Margaret Thatcher. Opus, Steve Dallas, Bill the Cat, Milo Bloom, Michael Binkley, and Cutter John will always resonate with me. I used to love handing my copies of the paperback collection of the strips to friends and watching them get hooked. I looked forward to these strips with great anticipation. Frankly, the strip probably provided the juice that brought me to journalism in the first place and made me an independent thinker. For some context: this was pre-public access to the internet, pre-cable and pre-CNN world. I lived in a two channel universe with no library and depended on my weekly Maclean's and Time for a world view. Bloom County helped me make sense of it all - providing a healthy dose of sarcasm and humor,. I still haul out my ragged copies of the collections all these years later. I refuse to let them go. From time to time I pull them out and chuckle. Bloom County Babylon is right there with the bible as a fall back for good reading anytime. 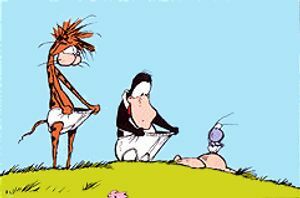 Welcome back Bloom County - you picked a fine time to return! The politcal and social climate is ripe for skewering!